Sapphire® Soft Leaf Buffalo is proven to be the most shade tolerant turf out of all the Buffalo varieties tested. It has a 70% shade tolerance only requiring 2-3 hours of sunlight per day where other varieties can only handle up to 50%. Sapphire® Buffalo has a very deep root system with thick stolons which allows it to thrive in hot humid weather and can survive below freezing temperatures. It is a fantastic looking turf holding it’s colour well during cold winters Most buffalo types have the reputation of being coarse and scratchy but this is not the case with the Sapphire® Buffalo. This variety of Buffalo has a super soft leaf that folds in half along the axis giving it an extra fine appearance and protection from Queensland’s extreme climate. Sapphire® Buffalo runners rapidly grow across the ground which enable it to repair quickly and recover from high traffic and stressful situations. The runners grow like a tight knitted mat restricting and out competing weeds leaving very little room for them to grow through. Sapphire® has also been proven to be less thatchy and spongy like most other Buffalo varieties. 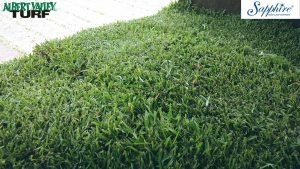 Sapphire® Buffalo is a slower growing buffalo grass, which will require less lawn mowing and maintenance than most other buffalo types. It requires mowing very 5-10 days in summer and every 3-6 weeks in winter. The recommended mowing height is 2-5cm in sunny conditions and 5-7cm in shaded conditions. Sapphire® Soft Leaf Buffalo B12 can be used for residential and commercial premises and with correct turf maintenance will give your garden the advantage of a brilliant green, manicured finish that will be the envy of your street. 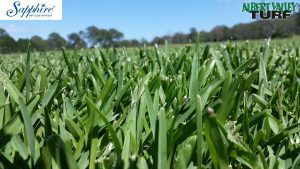 Ready to discuss supply and delivery of your new turf? Please contact us today. Albert Valley Turf has been operating for over twenty years. We also supply Empire™ Zoysia, Wintergreen Couch and Oz Tuff® Couch. We have an experienced landscaper on-site who can assist you to make the right decision for your garden and we offer delivery and turf laying services.